Sign Up Already Have a Login? Westgate's Travel Partners program is a turnkey business that allows owners to sell Westgate vacations and generate personal income from the comfort of their own home. Learn more and upgrade to our Westgate Travel Partners program today! There’s nothing easier than sharing the joys of a Westgate vacation. And the Referral REWARDS add up fast. I can earn money by simply offering others an opportunity to enjoy an amazing, discount vacation at Westgate. That’s what I call a Win-Win. Thanks Westgate, for making it so simple to earn Rewards. I posted a vacation package on Twitter and Facebook, got a referral and got paid! 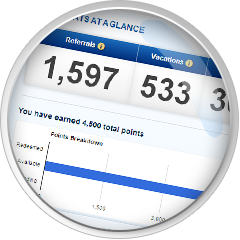 I paid for my timeshare in less than a year by using the Owner Referral Program. The marketing bulletin board works great. I posted one at work and one at the YMCA and I’ve already received three referrals! I love the Westgate Rewards program. I never realized how easy it would be to generate referrals and earn Rewards! Use your Owner Account Management email and password.